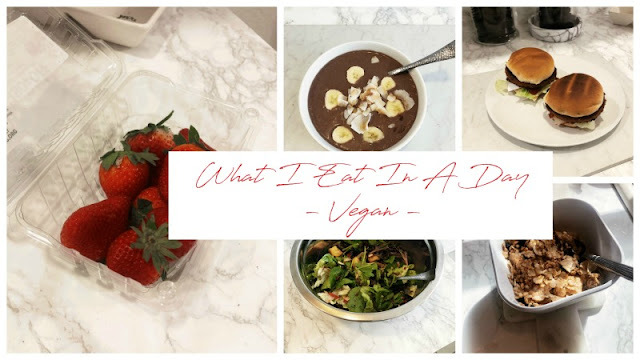 Now I know a lot of bloggers do posts like this, but I wanted to share a pretty realistic version of what I eat in a day, because honestly I don't have enough time in the day to make elaborate vegan meals, and I know you at home probably don't have time for that either. Also take everything with a grain of salt, all though I do eat these foods a lot, I definitely switch it up from time to time and try out recipes. If you'd like to check out those recipes follow me on Instagram @OFFICIALSAVVYJ and check my stories, Im constantly showing you guys how I make some of my favorite foods, like my sesame broccoli and my greek oven potatoes! Anyways... lets get into it! Lets start off with breakfast, now idk about you guys but I am actually not a big breakfast person. Never have been. Not sure if its because Im not a fan of sweet foods, which I feel like is the general standard for an American breakfast, or if its because I lack appetite in the morning but one things for sure, I like to keep my breakfast easy, and simple. For this I have one of the following two things, either a Acai smoothie bowl or a bowl of cereal or granola with coconut milk. For cereal I usually go with about 1 cup of some type of blueberry granola cereal, and half a cup of unsweetened coconut milk from the brand ''Silk.'' I highly recommend coconut milk with your cereal if your cutting out dairy, because it honestly just tastes the best in my opinion lol! Also make sure you get unsweetened! This is a major key because for one, I personally think it tastes better, two - for some odd reason 'original' coconut milk is kinda thick and creates kind of a gross texture for cereal. Unsweetened is also only 40 calories per cup while original is 80 - some times 100 if its vanilla. The second option is an at home Acai bowl. I make mine by buying packets of frozen Acai from the store. Then I add in 1/2 cup coconut milk, a banana, a handful of frozen strawberries and a Tbsp of peanut butter, blend it in a blender and put sliced banana's and shaved coconut on top and there you go! A easy way to make an at home acai bowl! Its also super light which I like in the mornings because like I said I'm usually not that hungry in the AM. Next up is probably the most consistent thing I eat every single day! A big salad! I used to try to attempt every day to make a whole meal at lunch time, and then realized it was causing me to skip lunch, because I was always to busy in the middle of the day to stop what I was doing and cook a whole meal. So I started to make a salad, which now is the staple item I eat every single day at lunch time! It make not look to impressive in the pic but trust me, its super good! Last but not least dinner! Dinner is definitely the time of day when I am usually the hungriest, I also started to go for a run everyday like an hour before dinner time so that definitely works up an appetite! So for dinner something I love to make is beyond burgers! There so good, and filling! I usually make one with a normal low cal bun and one wrapped in lettuce but for the sake of the photo I used two buns, otherwise it would have just looked like a pile of lettuce lol! I actually love wrapping them in lettuce! Which is something I never thought I would love but its so good and makes eating a beyond burger feel so light and fresh, instead of being super heavy with a ton of bread! For my burgers I make them with sautéed onions, lots of lettuce, some thin slices of that Violife feta (told u i was obsessed) and some ketchup/mustard, I try to stay away from heavy sauces...because even though the brand "Just" makes amazing vegan ranch, thousand island, etc. and ''Daiya" has great section of sauces as well they all are about 100cal or so per Tbsp. Which is a lot more than organic ketchup and 0 cal mustard! I hope you guys enjoyed my realistic what I eat in a day 2019 version! The last thing I want to talk about is this amazing app that I recently started using! Its called SweatCoin, and it literally pays you to workout! Im not kidding! Sound to good to be true? Its not! Basically SweatCoin is an app that allows you to earn coins from your steps! You can accumulate these points and trade them in for some amazing things! 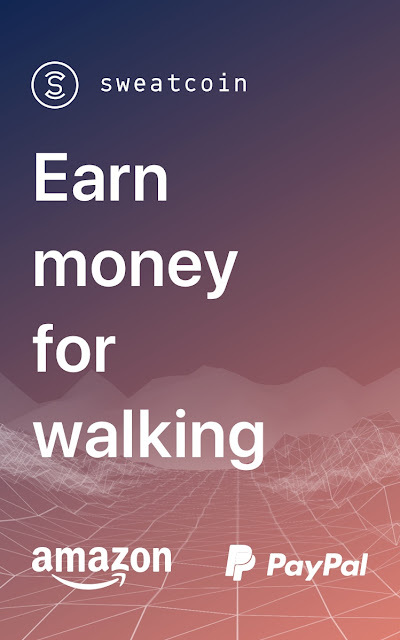 The app tracks your steps all the time so as long as your up and active and have your phone with you, your earning points! You can earn so many perks & prizes! From earning $10 off your next energy bill to a Foreo Luna Play cleanser to even winning things like a new TV! The more active you are to more you can get paid! Use this link to sign up and let me know how you guys like the app! Im loving it! www1.sweatco.in/i/savvy666894 Check out this free app It pays to walk! Hope you guys enjoyed todays post and hope to see you back next time! Love you, xoxo!